"You know the rule. Your a-- is your own, but if you get fondled in here, the money is for me." 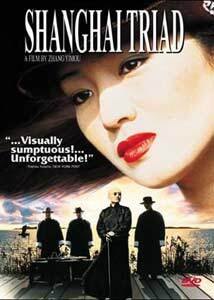 Shanghai Triad is well advertised and touted as some kind of dark, gangster thriller. A film that, at first, seems strange in the history of controversial Chinese filmmaker Zhang Yimou. His previous films have delved more into the cultural subtleties and problems of China, primarily that of women. Once Shanghai Triad is well underway, however, it becomes clear that it is not really a thriller about Triad gangsters per se, but another subtle period drama about China's past. Once again actress Gong Li portrays the mysterious central character, and once again Yimou places her into an almost dreamlike recreation of a time long passed. Triad begins when a young boy, Shuisheng (Wang Xiaoxiao), arrives from the Chinese countryside into Shanghai circa the 1930's. His uncle has a new job for him, working for the local boss of the Tang Triad mobsters. Shuisheng is himself a Tang relative, making him a good choice for a servant in the family. He ends up as the personal maid for the Tang lord's mistress, Jingbao (Gong Li), a spoiled prostitute who, because of her relationship to the Triad, assumes she's in a position of power and authority. Shuisheng proves a fairly lousy servant, but Jingbao seems to enjoy tormenting him and making fun of his country origins. Their relationship is a tense one, with Shuisheng obviously holding a grudge for his treatment. At the same time, Jingbao is having a dangerous affair with one of Tang's most respected henchmen. She soon realizes what a terrible sham her relationship is with Tang, and eventually she begins to rebel, just slightly, against her treatment of being used as simply a entertainment tool for Triad bosses. Shuisheng bears silent witness to it all, and somehow receives a sort of training in what his life will undoubtedly be like when he matures into the higher levels of the Triad. The film is presented with lush visuals and a distinct style, incorporating an effective sense of the time period. Of course, one of the naturally intriguing things about the setting is how traditional Chinese cultures mingles with the 'modern' culture of the 1930's as well as the heavy British influence present in Shanghai. Despite being set a in world of gangsters, however, the film is fairly quiet and subdued. It's more about the lives of the characters; the fact they're Triads is simply background. In a way, the film has the feel of an Asian Godfather, because just as that film told the story of a family's odyssey through crime, here we see the same general setting, only this family is far more dysfunctional. The core story, though, is Shuisheng's strange, voyeuristic relationship with Jingbao. While this all sounds extremely deep and involving, the movie falls a bit short of its ultimate goals. Mainly, the story is a bit bland and at almost two hours, the slow, methodical pace of the film becomes something of a chore to wade through. I would say this is mainly caused by the fact that Jingbao is a very unsympathetic character. Not only does she have rather loose morals, but she's an extremely mean-spirited, whiney character. Following her story becomes somewhat predictable, despite the lavish visual approach. The length seems badly spent on meditations that conflict with the various subplots, and renders it boring. All this isn't to say that the film is bad, it just really didn't feel much like the historically epic tales one is used to from Zhang Yimou. I will say, though, it takes the right attitude and patience to get the most out of the film. It tells an interesting tale and immerses you in another time and place, but it also seems to have trouble figuring out which story to tell. Is it about Triad mobsters and their cycle of violence? Or is it about a young boy who is ushered into a far-too-adult world by a cruel mistress? Attention is given to both plots and, as a result, both suffer from the distraction. Image Transfer Review: The anamorphic transfer has given an appropriate amount of depth and texture to the lovely visuals of the film, but a few problems keep this disc well from the 'A' bracket. Much of the film uses smoky, hazy visuals, often set inside a seedy nightclub and accented by diffusion filters. Unfortunately, these scenes bring out a lot of compression artifacts and obvious pixelization, especially in bright colors. The film runs at an embarrassingly low bitrate (between 3-4 mbps) for a single layer film with no extras or 5.1/DTS soundtrack. I wanted to go easy and keep it in the 'B' bracket, but considering so much of the film uses soft visuals, the presence of the artifacts is too obvious. The film winds up looking very grainy and much older than it should, despite the fact that the source print is in seemingly great condition. Audio Transfer Review: The Dolby 2.0 Surround audio is very well mixed and provides an extremely diverse sound field. Almost every scene in the film contains extremely ambient mixing and lots of accurate directionality. Surrounds are used when appropriate to beef up the front channels, mainly in the scenes taking place in the clubs and crowded parties. Subtle details like music playing in the distance, or the sounds of streets are very accurately rendered into the mix. This track compliments the film very nicely. 3 Other Trailer(s) featuring Bizet's Carmen, Orlando, Emperor and the Assassin. Extras Review: Other than some trailers and very thin bios, the disc doesn't contain much else. The keepcase booklet has a brief interview with Zhang Yimou and some production notes. Chapter stops are adequate, but the menus are bit bland. The English subtitles are white with black bordering and are usually kept as far out of the 1:85:1 image frame as possible. The subtitles are of very good quality and include translations of text and other material in the film that isn't usually translated in basic subtitle tracks. Fans of Yimou's previous work (like Ju Dou and Raise The Red Lantern) will find this film more accessible than newcomers to his work. Though flawed, the film is still an example of very careful, stylish filmmaking, set in an extremely romantic period in history. Recommended.